Bring the power of OptQuest to your coded models in minutes! SimWrapperTM quickly and easily integrates with your custom simulation model providing an intuitive user interface for simulation optimization and analytics. 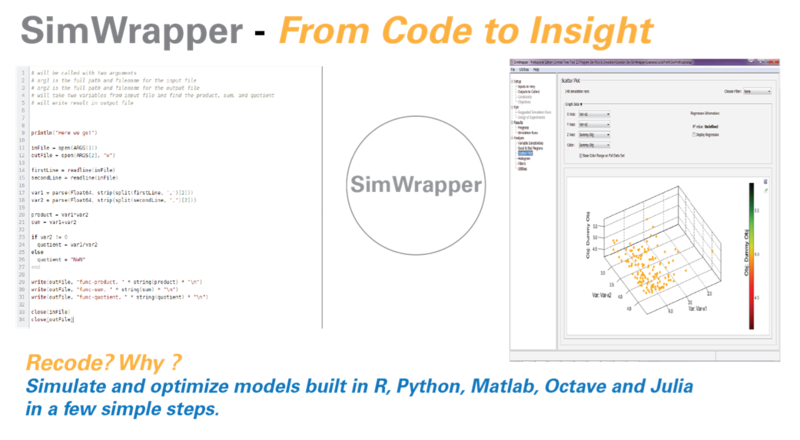 Build your model in Java, Python, R, Matlab, Julia, or any other language or framework, and then use SimWrapper to perform optimization, experimental design, sampling, batch runs, and analytics on your model. Analysts invest large amounts of time and money creating a simulation tool, populating it with data, and validating it for use. However, analysts rarely, if ever, retrieve all of the knowledge and insights that the model may yield. What configurations of the model inputs yield the best and worst model output values? For a model output, which model inputs have the greatest impact? Are there model inputs that have no impact on the model outputs? With multiple competing objectives what are the best possible tradeoffs between them? Answers to these questions are not only important for validating the legitimacy of the model, but they provide key insights for decision makers within the organization, increasing the return on investment of your simulation studies. SimWrapper is, a cross-platform, Java application that can be used to wrap virtually any new or legacy simulation model. You can run it on Windows, Mac, or Linux, wherever your model runs. The user interface guides the user through specifying the simulation inputs to vary and the simulation outputs to collect. SimWrapper interacts with OptQuest (OptTek’s proprietary optimization engine) to perform optimization, design of experiments, sampling, and batch runs. SimWrapper then uses OptAnalysis (OptTek’s library of analytical tools supporting simulation output) to analyze completed simulation runs and provide information on simulation input sensitivities and good and bad regions of the defined tradespace. SimWrapper also provides two - and three- dimensional plotting of simulation inputs and outputs to visually explore the executed simulation runs.